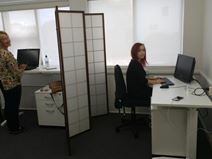 Fully-furnished and professional, this office space is located in the heart of downtown Auckland and provides fibre-optic Internet and a team of friendly support staff. A quick stroll gets you to Viaduct Harbour and Wynyard Quarter, with their abundance of bars and restaurants. Flexible terms and all-inclusive pricing means you're in control in this space - no more battling with landlords to get what you deserve. Close to Britomart train station with fantastic harbour views, these private offices benefit from a great location in Auckland"s CBD, with local bus stops right outside the building. Each office has 24-hour access, lockable doors and the option to include furniture if needed. The friendly on-site staff offer a warm welcome to any guests, and the vibrant local area is the place to go if you're looking to wine and dine potential clients. This landmark building located on Albert Street offers members a newly refurbished grade A workspace. Spectacular views are visible across the Waitemata, and the street views are sure to impress any visiting clients. Work collaboratively in the comfortable coworking space or dream up new ideas with your team in the professional and spacious private offices. This Auckland location is just a short walk from the Viaduct and Wynward Quarter, and has easy access to a number of commuter options, from motorways to bus stops. 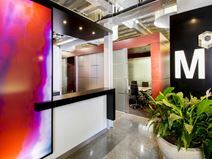 This updated, modernist building offers an impressive entryway for your clients to arrive into - a double height atrium with a winding modern sculpture will definitely make for a talking point with visitors. Well-lit offices and meeting rooms show off the quality and care put into the designs of this space, with the comfortable coworking space providing an area which allows you to work the whole day through without feeling like you're in the office. 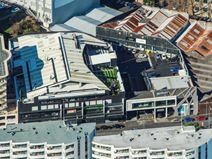 Situated on the fringe of Auckland's CBD, within Newmarket home to New Zealand's fastest growing commercial centre and premier retail district. This centre consists of 32 offices that range between 7m² and 30m², spread over two floors, with the largest space suitable for eight people. The internal, external and corner office suites are modern and benefit from great natural light, with a wide range of facilities to help your business succeed. 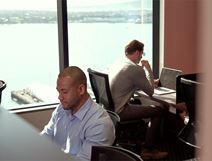 In the heart of Auckland’s North Shore, members of this contemporary business centre benefit from an attractive and efficient working environment, with some of the city"s best meeting room facilities available. Ample car parking is also available both covered and uncovered, which is perfect for the morning commute away from the traffic of the city centre. Thanks to the vibrancy of the area, you'll forget you're in the suburbs. Office space prices ranging from $345 - $1698 per month. In the heart of Posonby, 20 minutes walk from Mt Eden train station and three minutes' walk from the bus stop, you will find this centre. A community-centric, creative co-working space helping to connect value-driven business owners to their tribe. A pioneer of big ideas and facilitating ways for change-makers to grow to become leaders in their industry. A place to learn, be curious and try new things and providing a community for ambitious creatives, socially conscious businesses, designers, marketing experts, video producers, coffee companies, copywriters and web designers. Within less than ten minutes walk you can find yourself at Countdown, a pharmacy, a variety of coffee shops and restaurants, Western Park, or at one of the gyms: Anytime Fitness and CrossFit Auckland Central, providing you with great access to social and wellness infrastructure for your every day life. This brand-new workspace, due to open in 2019, will be part of one of the largest buildings in Auckland's Commercial Bay area. Offices in this space will offer tenants amazing views of the harbour from from the 18th floor location in this modern glass tower. Enjoy meetings with clients and informal gatherings among your workforce within the city's commercial hub, and choose from a number of eatery options when dining, whether alone or with clients. A selection of offices and a large open-plan space are available to let in a modern business centre. Fully furnished and technologically equipped, these office spaces are provided with meeting rooms, kitchen and reception area, alarm system, while copy and printing machines are available at extra charges. The business centre is located in a prime business address, which hosts numerous companies and offices and offers parking areas in the immediate vicinity. These offices are situated across the road from the Britomart Transportation Centre, one of the most central locations in Auckland. These well-designed furnished offices come already equipped with a range of amenities, from 24-hour access to a completely private phone room, where you can make calls safe in the knowledge that no-one can overhear. Parking is available at a number of locations surrounding the centre, and the building also benefits from cycle storage. Located in central Henderson, this centre is a newly renovated, north facing office space boasting a community of like-minded individuals. With a shared comfortable reception room, a well lit main office and a large meeting room. All of the desks are standing desks which enable you to give your back a break from sitting all the time. Found on Great North Road in the heart of Henderson, this space is situated four minutes walk from Henderson train station making it easily accessible by public transport. Henderson Westfield shopping mall is located across the street with a full array of shops as well as being close to the main street of Henderson where signwriters, mobile phone shops, printing, and award winning coffee shops are located in addition to banks, restaurants and fast-food eateries. Conveniently located in a business district of Auckland on the fringe of the city centre, this building offers offices and meeting rooms fully furnished and provided with numerous facilities and services: cleaning and reception services, 24 hours access, telephone and broadband solutions, electricity...everything is included in the rent fee, so tenants do not have to worry about additional expenses. The space has a variety of options that range from co-working in our collaborative space through to private studios. A super-charged beach side community where you can get your best work done. Tap into great support, events, learning opportunities all while soaking in the killer view. The community that has been created offers a great place to connect with other like-minded individuals and includes folks working in everything from HR software to video animation. Offering both private and collaborative options on flexible terms, this space is located in the centre of Karanghape Road and is nestled among some of the world's largest leading businesses. Members have access to a variety of meeting and conference rooms as well as flexible office space, styled with designer furniture and high ceilings. Local transport links cover the area outside these offices, provided direct access to the city centre. This collaborative, social workplace is designed in a contemporary way to provide a place to both work and play, providing individuals with an environment that inspires creativity, productivity and success in all of your work ventures. Offering dedicated services with membership privileges that everyone can benefit from, this centre also boast facilities which will empower your business and provide intellectual and social nourishment for you and your business. This sleek, polished office space is full-furnished. Co-working, hot desking and premium serviced private office suites are on offer. Virtual office options are also available. There is a well-equipped kitchen, where you can prepare your lunch. Should you decide to cycle/ run to work, there are onsite showers. Boardroom and meeting rooms are well-furnished with conference facilities. 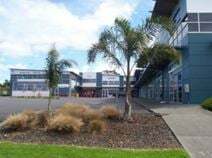 Located 800 metres from Auckland international terminal. Three minutes' walk from the space you will find Leonard Isitt Drive Bus Station and a 12 minute taxi journey will take you to Puhinui train station. Alternatively, parking is available two minutes' walk away. In the surrounding area, there is a McDonald's, KFC, Sushi restaurant and several other eateries. There is also a hotel, pharmacy, doctors surgery and Countdown. Opposite Royal Oak Mall, surrounded by a plethora of cafes, restaurants and bars as well as retail venues. With prime access to Auckland Airport via Pah Road and the main highway, you can be at the departures terminal in less than 20 minutes. A newly fitted out space with private offices that are contemporary and colourful. All inclusive rates include utilities, wifi and access to all the shared facilities including a kitchen, meeting room, WCs, and reception area, as well as your fully furnished spaces with lockable storage. Modern offices are available for flexible renting in the heart of Auckland's newest business district. Fully furnished and with sophisticated designs, these office are equipped with the latest technology to offer you a professional and efficient working environment. The area hosts numerous leading companies and a variety of amenities, in a stunning surrounding landscape, with buses stopping regularly close to the office, and Britomart mainline rail station just a few minutes walk down the road. A brand new business centre will soon be opening in the dynamic commercial district of Auckland. This is a prime business location, which hosts banks, offices, shops, restaurants and cafes. The centre is modernly designed and consists of offices, meeting rooms, business lounge and the most advanced telecommunication facilities and IT systems. The business centre is well connected and easily accessible. These are top-of-the-range business premises in a sought-after location, providing 16 elegantly furnished suites for between one and five people, with a variety of businesses and amenities in the same complex. Allocated parking is available on-site, and the centre enjoys excellent access to major shopping facilities. This well-trafficked area of Albany is just a few minutes away from the Northern Motorway on/off ramp and not far from Auckland's CBD. Set within a landmark building, which hosts various leading companies, these offices offer a very professional environment which will enhance the image of your company. The offices are elegantly furnished to a high standard and are provided with a spacious meeting/conference room and terraces. Secure parking is available within a few minutes walk of the centre, and buses run regularly from outside the office, with Britomart railway station less than 10 minutes walk away. This is a unique opportunity to rent offices in a landmark building in Auckland's premium CBD. The building, which hosts international leading companies, has been designed by a famous architect with great attention to detail. It is located in a prime business location, which will definitely enhance the image of your company. You can benefit from 24-hour access and high-speed internet with a 99% up-time, plus access to meeting and boardrooms. Just a few minutes from the heart of Parnell, this fantastic city fringe location provides a modern, innovative workspace with barista quality coffee, breakout, plus professional meeting spaces. The warm and welcoming staff are available to greet your guests, and the fantastic harbour views are sure to impress. Local bars and restaurants line the streets outside the office, and hotels are available for your guests to stay in overnight. Fully furnished, serviced office suites. Meeting rooms are available, which can be booked free of charge for up to one hour per week. Enjoy ultra fast broadband Internet/ WiFi. Weekly cleaning of the office space ensures that the work-space is kept clean and presentable. There is 24/7 access and security. A receptionist is on hand, who can welcome you visitors to the space. Located in the North Harbour area, just off Constellation Drive. The nearest bus stop is situated just two minutes from the space. Access to nearby motorways is easy. Anytime Fitness is positioned opposite the space. In the vicinity there are shops, restaurants, supermarkets and banks. This space, located within the Grey's Lynn suburb of Auckland, on the fringe of Ponsonby, offers private offices and coworking spaces which have amenities including meeting room access, 24-hour access, complimentary beverages and comfortable breakout spaces. Choose from a number of local business to provide your coffee intake, or dinner with clients, and benefit from the fantastic transport links in the area.